It is a sample of tissue removed from a living body to discover the presence, cause or extent of a disease. 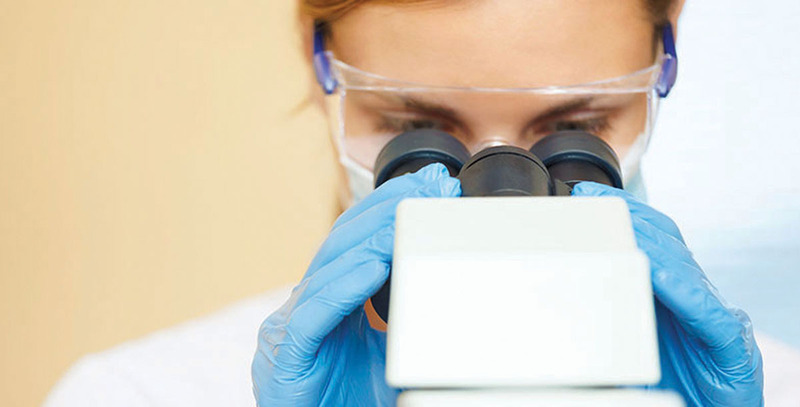 A biopsy can be taken in almost any tissue or organ of your body. Excisional biopsy is a surgical procedure where the tissue is surgically removed from your body by a surgeon. Core biopsy is when only a sample of pathology is removed with preservation of the architecture of the host tissue. This procedure is usually performed by a radiologist. A core biopsy is done to assess a lump or abnormal change picked up, by either an ultrasound, mammogram (X-ray imaging) or an MRI (magnetic resonance imaging), in your breast. The type of biopsy performed will depend on the visibility and size of the lesion/abnormality, accessibility, and experience of the radiologist. Fine needle aspiration biopsy is done with a thin needle (about the same size as a needle used for drawing blood). The radiologist inserts a needle into the lump and removes a sample of cells or fluid. This is used for a rapid diagnosis but the sample is usually not sufficient to base treatment on. Core needle biopsy is when a needle with a special tip is inserted, and removes a sample of breast tissue about the size of a grain of rice. This is the preferred procedure as it provides sufficient material with a small incision. Vacuum-assisted biopsy is done with a probe that uses a gentle vacuum to remove a small sample of breast tissue. It’s increasingly being used to non-surgically remove some benign breast lumps. Both a core needle biopsy and a vacuum-assisted biopsy require local anaesthetic to numb the pain as the needles are thicker in size. How will you find this lump in all the fat? Ultrasound-guided biopsy uses the ultrasound machine to guide the needle. Stereotactic-guided biopsy uses specialised computer technology and X-rays to guide the needle into a lesion, which is only visible on a mammogram but not an ultrasound. MRI-guided biopsy uses specialised computer technology and MRI to guide the needle into an abnormality only seen on MRI. Are you taking any medication or supplements? Some medication may increase risk of post procedure complications. Do you have any bleeding problems? Are you taking blood thinners? This may put you at risk of excessive bleeding during and after the procedure. Any allergies? Especially to anaesthetics? You may be prone to an allergic reaction to the local anaesthesia. Are you pregnant? X-rays may be harmful to a developing foetus. Do you have a pacemaker? MRI may adversely affect the function and positioning of a pacemaker. You must give your doctor written informed consent. It is a bedside outpatient, sterile procedure, lying on a bed or standing, that takes about 20 minutes. The breast area is cleaned with antiseptic solution. Local anaesthetic is injected or applied to the skin. A small incision (+-1mm) is made to allow the needle to go through the skin. Several samples are collected (each about the size of a grain of rice). Samples are sent off to a laboratory for testing (histology). Note: local breast tumour spread as a result of a biopsy has not been proven. You will be instructed on how to care for your wound at home. Bruising and discolouration is expected. Look out for any complications, such as infections (redness, pain or discharge at the procedure site) or persistent bleeding. Scarring is rare as the incision made is only +-1mm. Most laboratories can take 48 hours or up to a week to process and analyse the sample, so patience at this stage is a challenge. Managing anxiety is also key. Once your radiologist has received your results, he/she will discuss the results and further management with you. Note: Most biopsies ordered on the basis of an abnormal finding are benign. The procedure is, however, necessary in order to exclude cancer. Dr Jowie Masetumo Mbengo is a radiologist, and a Reach for Recovery board member. 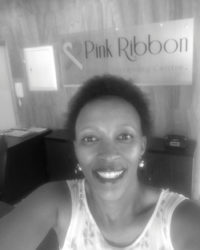 She is the founder of Pink Ribbon Breast Screening Centre, in Gauteng, and is also a consultant radiologist at various radiology practices countrywide.